A freeform swimming pool is designed with a more naturalistic approach, using an irregular shape or style, and has more flowing lines and curves. Many new freeform pools will have waterfall or rock features to give it a unique look. A freeform swimming pool can be a lot of fun to design. This type of design will allow you to create something non traditional for your home. Whether you want a pool that can just fit into your existing surroundings or you want a pool that looks like it has a beach vibe, a freeform swimming pool is the perfect way to make a backyard oasis. Using a gunite design will make sure your pool is built to last and you will have enjoyment for your swimming pool for years to come. Gunite pools are much easier to construct than other swimming pools, and there are a lot of things when constructing concrete swimming pools that are out of your control, such as outdoor temperature. Due to the design of gunite pools, your pool builder will have more flexibility and you can start enjoying the benefits of a freeform pool faster. Many traditional pool options don’t fit well into an existing backyard. If your backyard has a lot of trees, then with a freeform swimming pool you don’t have to cut them down to install the pool. You can actually use the trees to create a more nature-centered design and use them to your advantage to get some shade. If there are rocks in your backyard you can use those as well and incorporate them into the design. Flexibility: The pool’s fluid design will allow for natural grooves, which gives you the flexibility to blend into the existing landscaping and create pretty much anything you want. This could be poolside seating, a shallow beach area, waterfalls, or an attached spa. Natural: When using waterfalls or rock features, these pools can almost blend into the surrounding nature and create the perfect serene spot you will want to enjoy each day right in your backyard. Customizable: The best feature about freeform gunite swimming pools is that they are customizable. They don’t have to conform to any specific proportions, which makes them ideal for those who have a backyard with a different shape or a smaller space. Can Fit in Any Space: If you are worried that your backyard is too small for a swimming pool, you shouldn’t be because you can still take advantage of a freeform pool. Working with a professional pool contractor can help make sure that your backyard space is utilized efficiently, so you don’t feel like your entire backyard is just your pool and it looks nice. Enjoy the Many Benefits of a Pool: Since freeform pools can be installed in just about any backyard, you are able to enjoy the many benefits of a pool. Pools encourage you to spend more time outside with your family. When out in the sun, you get more of the natural absorption of Vitamin D, which is an important vitamin for everyday life. Exercising in the pool can also be an added benefit for those who have trouble working out with traditional methods. Even for those who don’t have trouble working out, a workout in your backyard pool can be a nice break from more intense and high impact exercise. 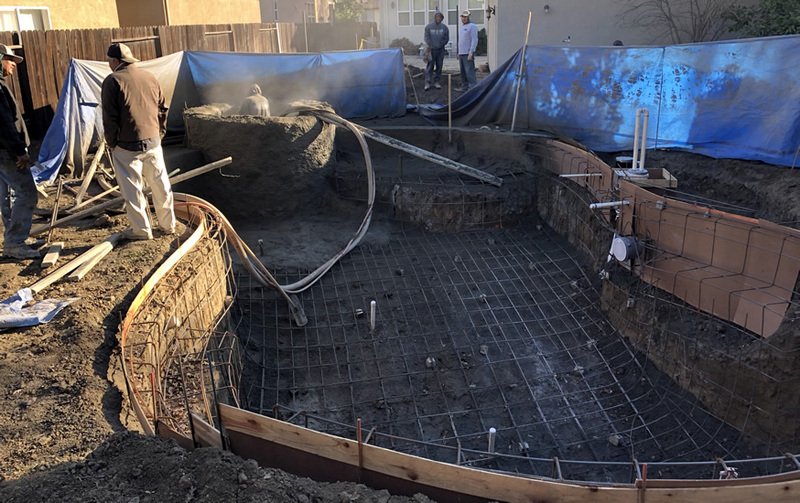 Sac Pool Pros, a pool builder in Sacramento, can help you design the freeform gunite swimming pool of your dreams.